Penguin Books, Limited (UK), 9780241146019, 320pp. 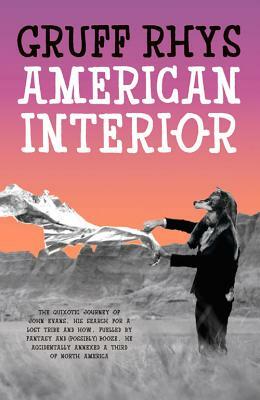 American Interior is a psychedelic historical travelogue from Welsh pop legend Gruff Rhys. LONGLISTED FOR THE GUARDIAN FIRST BOOK AWARD SHORTLISTED FOR THE GORDON BURN PRIZE In 1792, John Evans, a twenty-two-year-old farmhand from Snowdonia, Wales, travelled to America to discover whether there was indeed, as widely believed, a tribe of Welsh-speaking native Americans still walking the great plains. In 2012, Gruff Rhys set out on an 'investigative concert tour' in the footsteps of John Evans, with concerts in New Orleans, Baltimore, Philadelphia, Pittsburgh, Cincinnati, St Louis, North Dakota and more. American Interior is the story of these journeys. It is also an exploration of how wild fantasies interact with hard history and how myth-making can inspire humans to partake in crazy, vain pursuits of glory, including exploration, war and the creative arts. GRUFF RHYS is known around the world for his work as a solo artist as well as singer and songwriter with Super Furry Animals and Neon Neon, and for his collaborations with Gorillaz, Mogwai, Dangermouse and Sparklehorse amongst others. The latest album by Neon Neon, Praxis Makes Perfect, based on the life of radical Italian publisher Giangiacomo Feltrinelli, was recently performed as an immersive live concert with National Theatre Wales. GRUFF RHYS is known around the world for his work as a solo artist as well as singer and songwriter with Super Furry Animals and Neon Neon, and for his collaborations with Gorillaz, Mogwai, Dangermouse and Sparklehorse amongst others. The latest album by Neon Neon, Praxis Makes Perfect, based on the life of radical Italian publisher Giangiacomo Feltrinelli, was recently performed as an immersive live concert with National Theatre Wales.